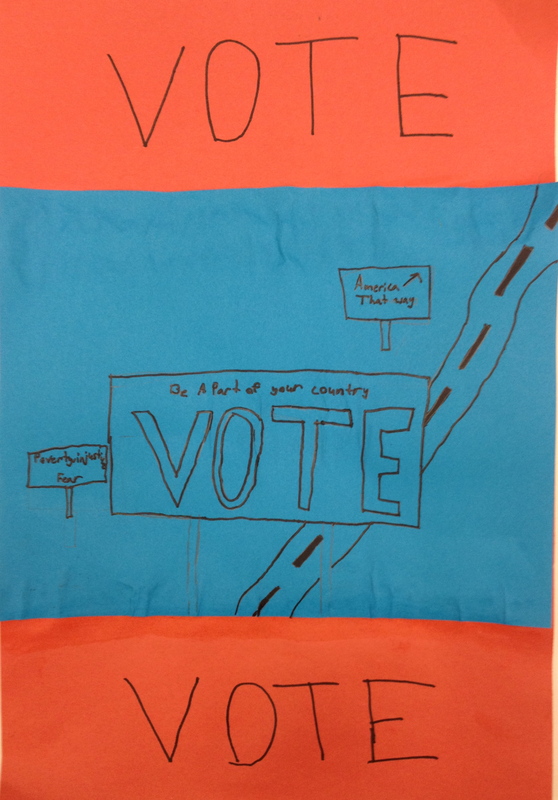 We have lots of exceptionally politically aware 4th and 5th graders at Randall Elementary. 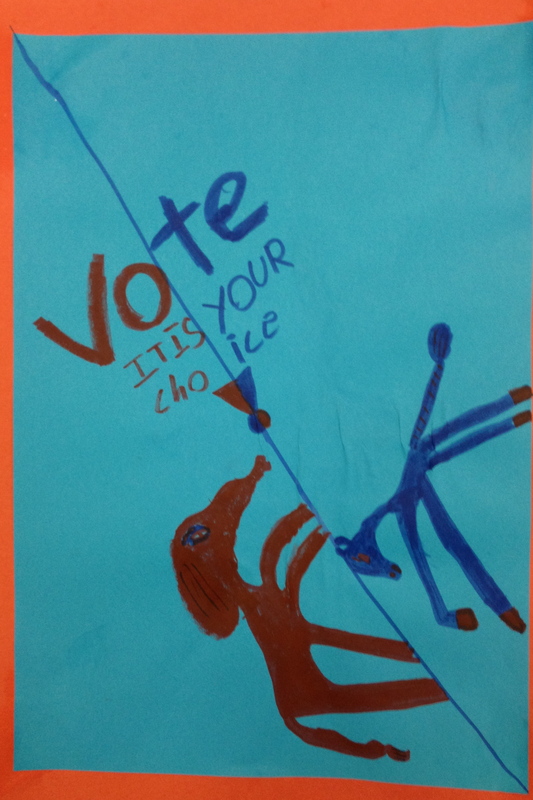 I decided I wanted to do a lesson around the idea of voting with the Presidential election coming up and because it is a subject many of our students are already interested in. Because many my students come from very progressive homes and they live in Madison, I thought it would be a good idea for them to learn what the term ‘non-partisan’ means as well as know the main issues from Democrats and Republicans. I began by showing this video called “I’ll Be the President” from Flocabulary.com which seems to have kind of a modern School House Rock thing going on. This might be a favorite Randall song now as they are also learning it in music with Ms. B for our November all school morning meeting. 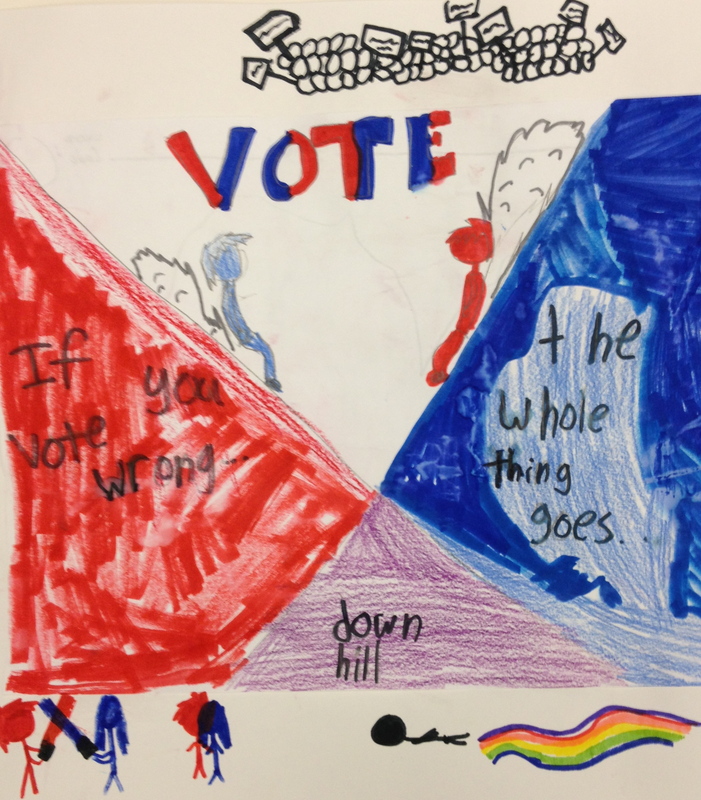 We discussed the word non-partisan with the kid-friendly definition of not telling someone your opinion about politics but just giving the facts. 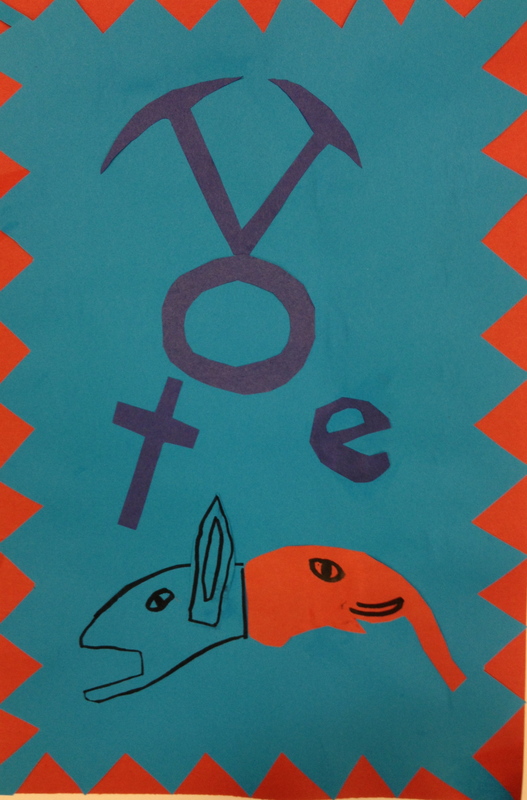 One rule in our posters is that the viewer can not tell what the political beliefs of the artists are. 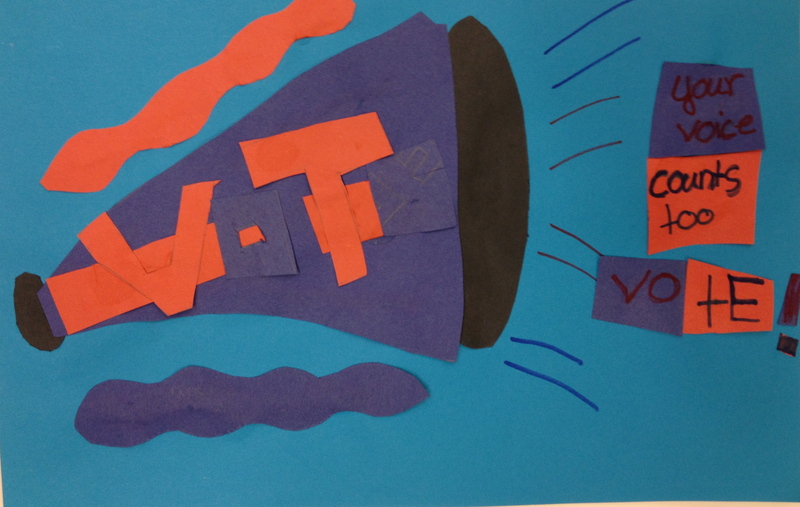 Some of our students have very strong opinions so this was rather difficult for some of them. We also discussed how important it was to listen to people who have different opinions than you do because that is how we grow and are challenged. 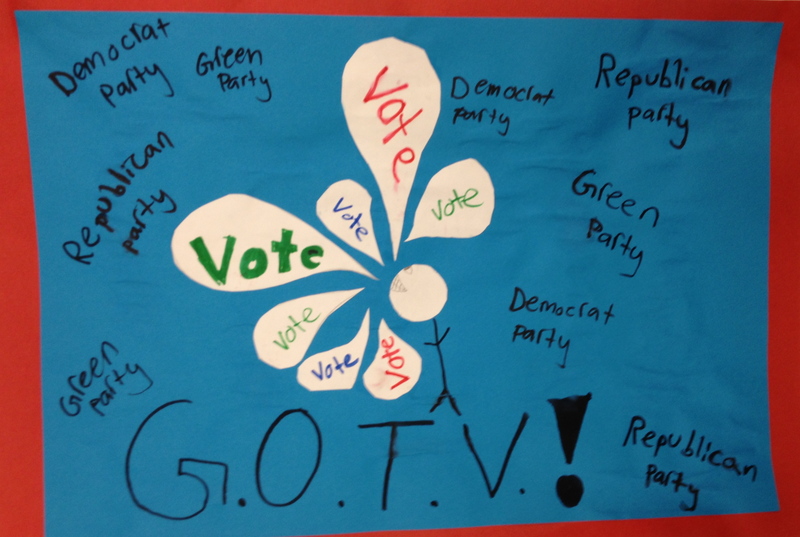 We learned about the main beliefs from Republicans and Democrats from this video discussing political parties. 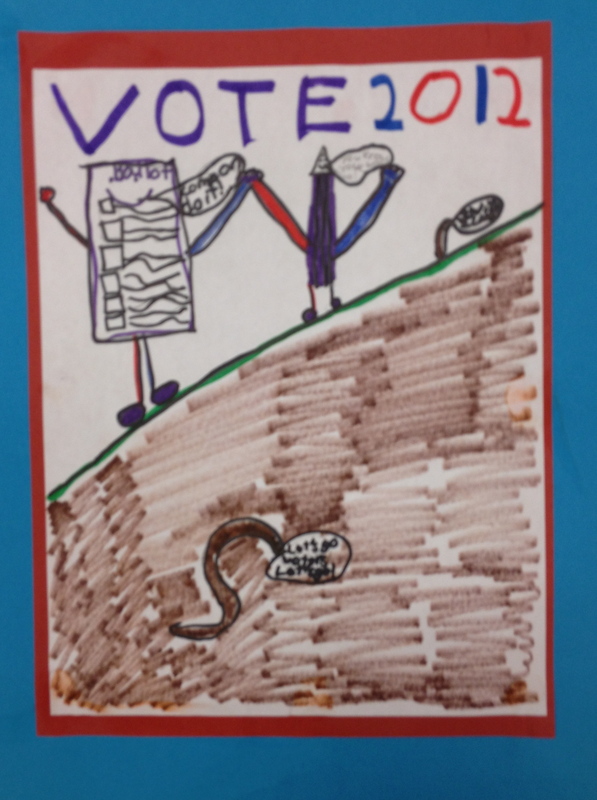 We also learned that Mitt Romney and Barack Obama are not the only two running for president. 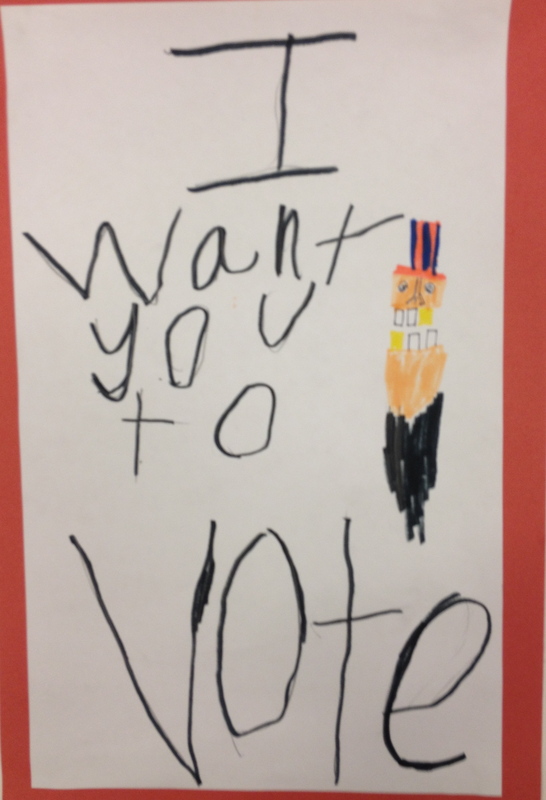 Many students were surprised to find out there was a woman running for president as well! From a design standpoint, we talked about the principles of space and balance and filling the page as well as lining things up contributes to a well thought out composition. 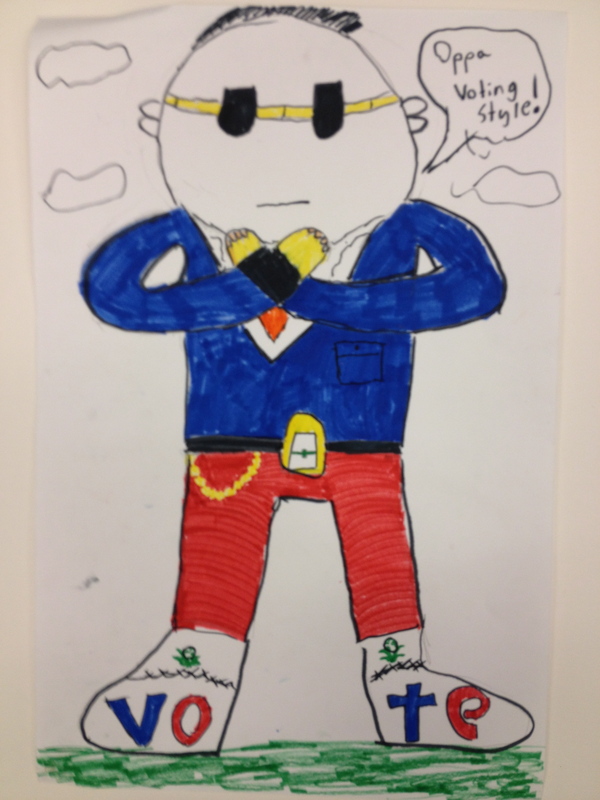 This was a great lesson to discuss symbolism as well. 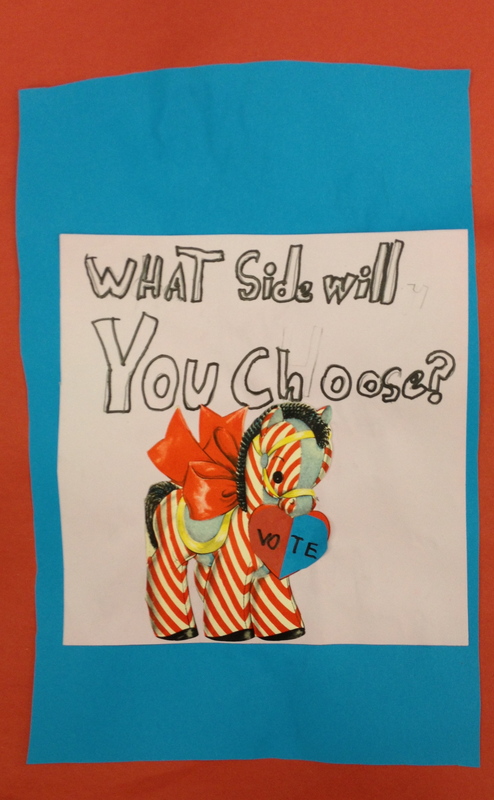 Red and elephant for Republican, blue and donkey for Democrats. 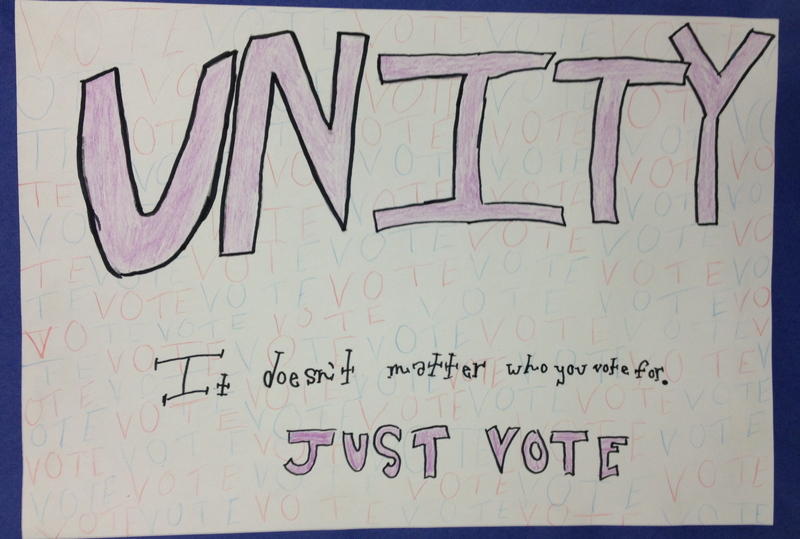 A couple of bright students took this idea to the next level and asked questions like “Could purple be used for unity?” or “Can I see some of the third party logos?” Like I said, these students are exceptional. I mean I’m sure every art teacher says that about their students. I feel like a parent with my students, I just like to brag about them!! 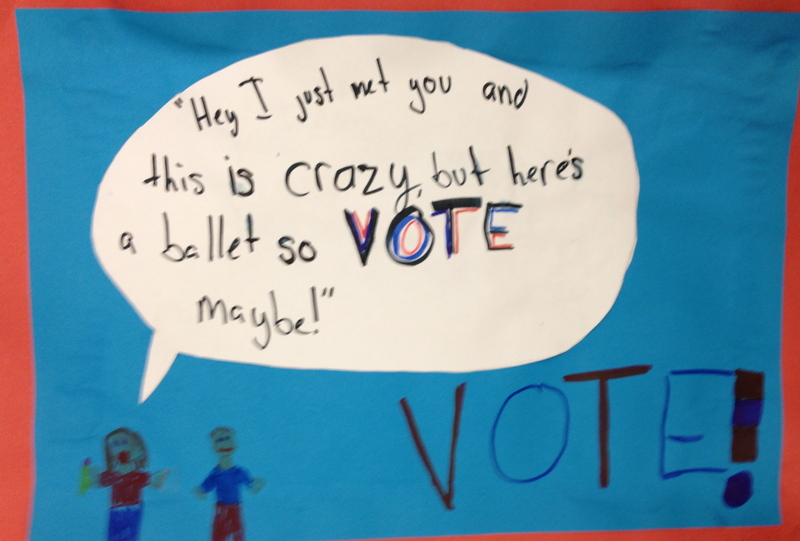 Some artists thought about how to use popular culture and humor to create interest around voting. 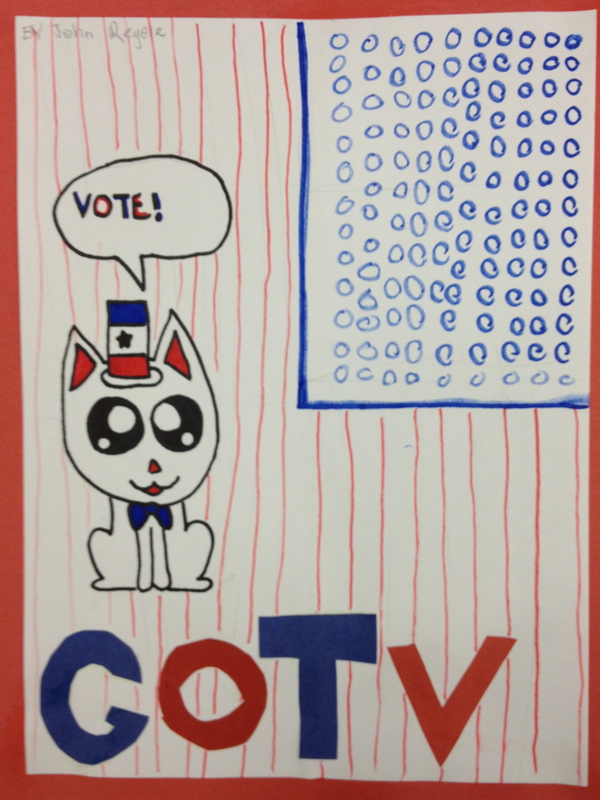 Can you guess where the ideas for these posters came from? Make sure to take a walk down Monroe St as some of our Randall artists are displaying their posters at Orange Tree, Art Gecko, Pizza Brutta, Sewcial, J. Kinney Florist, Paragon and Monroe St Framing. Thank you to our local, small businesses on Monroe Street! I didn’t get time to ask more businesses to participate so if they don’t have Randall art in their windows, it doesn’t necessarily mean they said they wouldn’t display art. I love supporting my local, small businesses when I shop because I know they support my students and the community in so many unmeasurable ways! Display at Sewcial ^ This is the owner of Sewcial, Sarah. Sewcial is new to Monroe Street and already very popular. They offer many different classes to fill your create fabric arts needs! I highly recommend checking this place out.